I have been thinking about this project and will probably try a few different alternatives to see how the photographs shape up. My first thought is that this might be an extension of the main ‘I am an Ironman’ project. I would make a series of portraits of myself immediately after key workouts during my ironman training build-up. I would still be dressed in my training clothes. I would do this over and extended period, specifically the timeframe of training for Ironman Germany which takes place in early July. Over this period the results of the training may become visible (i.e. I become leaner and fitter) and certainly the change from winter to summer clothing would be immediately apparent. I could add a caption to each image indicating the date and nature of the workout. Making the portraits immediately after a workout is a possible way of catching myself in an unguarded moment, i.e. I will be very tired and distracted by thinking of getting changed and having something to eat. 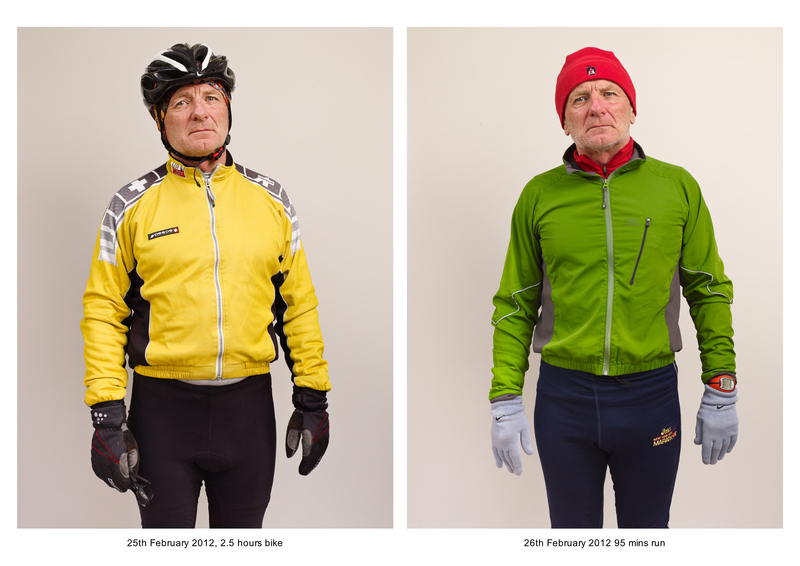 The series will also show me in many guises – as swimmer, runner, biker, yoga practitioner, gym member etc. I may also include some of me in normal clothing on days off. On a naive level this would demonstrate what’s involved in training for the ironman. Bulky winter clothing would suggest braving the elements; sweaty clothing would show the effort involved; the variations in clothing would represent the range of skills involved. Also my expressions and body language may signal how I’m feeling – provided of course I can avoid posing! By making the series of as a diary the degree of persistence and willpower needed to complete the training should also be apparent. On a critical level showing myself in multiple guises on many occasions will present a more complex (or decentered) reading of me as the subject than would be the case with a single portrait. What will result and how people will read it remains to be seen. Ultimately I may present the portraits if they work, as a series of grids with possibly one for each of the seasons I will be training in. I am thinking in terms of three grids each of nine photographs making 27 portraits in all. Here are the first two images I have made. As intended they were made immediately after the workouts. I shot six or seven images on each occasion and selected the one which in my view best represented how I felt. You’re certainly pushing yourself in all directions! This self-portrait aspect sounds really tricky and I’ll be interested to see how you deal with that aspect of ‘not posing’ .